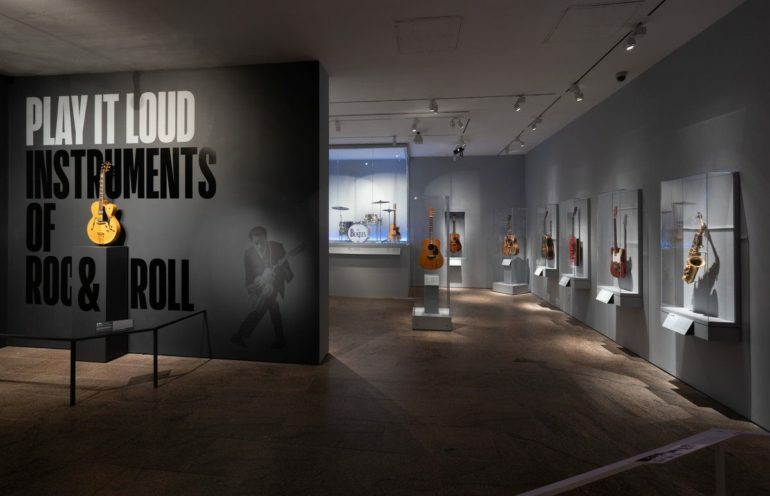 In cooperation with the Rock & Roll Hall of Fame, the New York Metropolitan Museum of Art is organizing the first ever exhibition of rock and roll instruments. Titled “Play It Loud: The Instruments of Rock & Roll”, the exhibition will open on April 8, and will include a range of instruments, from guitars and pianos to drum kits, but also vintage costumes, posters, and concert footage. The exhibition is staged thematically and as Smithsonian Magazine reports, “the display moves from musicians’ embrace of burgeoning rock technologies to the creation of “Guitar Gods,” instruments’ roles in shaping artists’ visual identity, and characteristically dramatic exploits such as the destruction of instruments during live performances.” Among those are a fragment of the guitar Jimi Hendrix burned at the Monterey Pop Festival in 1967 and a sculpture constructed out of the guitars Pete Townsend of The Who smashed during the group’s concerts. As Billboard reports, Jimmy Page, Don Felder of The Eagles, along with Steve Miller and Tina Weymouth of The Talking Heads and Tom Tom Club christened the exhibition at its preview a week ahead of its opening. As for Billboard, it commented that the exhibition is “an accessible embarrassment of riches for even the most casual fan,” and that “it demonstrates a need for treating rock n’ roll as the high art it is.” Easy to agree on that one.